You can execute an import where the import data is from a directory on a local drive. 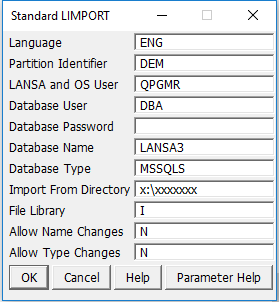 The Visual LANSA development environment does not have to be active to perform an import, but the Visual LANSA database services must be active so that the import can establish a database connection. Use the Parameter Help button for detail about any of the required input fields.